Hi. 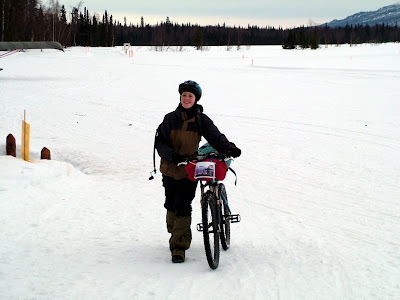 My name is Jill, and I am planning to ride my bicycle in the 2008 Iditarod Trail Invitational. 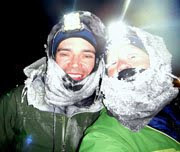 This event is a 350-mile winter wilderness race that follows the historic Iditarod trail from Knik to McGrath, Alaska. In order to get there, racers must pack all of their survival gear on bicycles specially built to ride on snow. Once out there, we must be self-sufficient for anything the Alaska winter can throw at us: wind, snow, flash blizzards, temperatures ranging from 40 above to 40 below, moose encounters, ice overflow, loneliness, isolation ... the list goes on. I entered this event not only for the challenge, but also for the opportunity to ride my bicycle through 350 miles of some of the most beautiful terrain I can imagine. I am not a career cyclist. I do not have pro deals or corporate sponsorships. I am just a regular person with a passion for cycling - one might say a passion for extreme cycling. I am self-funding this race on my small-town journalists' salary. It has really cut into the luxuries, but it is worth every penny to me. However, I have received tokens of help from people all around the world. I am always grateful to like-minded souls who generously give not only their monetary support, but also their emotional support. It feels great to be a regular passionate, cyclist sponsored by regular, passionate people. If you would like to help sponsor my race, you can click on the gold button below to make a donation through the Paypal link. Or you can contact me by e-mail at jillhomer66@hotmail.com. I send to every sponsor a CD filled with scenic Alaska photography that I have taken - some that has appeared on this blog, and some that has not. The compilation now covers more than two years of Alaska living and offers hundreds of photos, open for any use - commercial or personal. I also include a link to blogs or other Web sites in my sidebar under the heading "this blog brought to you by." If you have any questions or recommendations, please e-mail me. And thanks again for reading. Jill - I tried to donate, but it doesn't seem to work when I try to put in my credit card info (I try to type my name and nothing happens). I am phil@konamoxt.com - let me know how I can donate. I hope you are having a great time and that my small donation helps you rejoice your completion of the event/race.